We tend to think of the British honours system, for better or for worse (take a wild guess where I stand on this matter), as an exclusive club that sits snugly within national borders, British awards given only to British subjects. But while some notable medals are reserved exclusively for the locals, others can be handed out to anyone who has, and I quote, "brought distinction to British life and enhanced its reputation." Thus you don't technically have to be a UK resident to land an OBE (an acronym whose full title is The Most Excellent Order of the British Empire, which makes it sound like something dreamt up by Bill and Ted). During World War 2, for example, one was presented to Malayan Communist Party leader Chin Peng for his help in fighting the Japanese. We liked him back then. But when he turned on the British a few years later during what became known as the Malayan Emergency, we asked for it back. By then, of course, he was quite happy to lose it. In 2006 the award was given to Russian actor Vasily Livanov. It's not that unusual for actors to win ceremonial gongs, usually for their services to entertainment (for which, one might argue, they have already been rewarded by fame and wealth) or their somewhat more deserving charity work, but Livanov got his purely for playing Sherlock Holmes in five feature-length films made for Russian television. This may not seem like much given that our own Jeremy Brett played Holmes to perfection a total of forty-one times on British TV without winning a single award. But take another look at the above quoted qualification for OBE ownership and then take on board the phenomenal home turf popularity of the Livanov Holmes films. There's even a sculpture of Holmes and Watson based on the characters as played by Vasily Livanov and Vitaly Solomin near the British Embassy in Moscow. * Yes, they were that popular. All five films were directed by Igor Maslennikov, who later secured his reputation as a filmmaker of note with the likes of Winter Cherries and Philipp Traum, neither of which have found their way onto UK DVD yet. I was first made aware of his Sherlock Holmes films through a TV documentary on the various film and TV interpretations of Arthur Conan Doyle's most famous creation. Included were two short extracts from the Maslennikov films that had me instantly hooked. The first was the slightly disconcerting image of a Victorian British bobby asking questions in Russian (a sight no more peculiar, I would suspect, than an English-speaking Anna Karenina must be to a Russian audience). The second was from Maslennikov's The Hound of the Baskervilles and was one of the most haunting images I'd ever seen in a Sherlock Holmes film. I'll be coming back to that. But getting to see these films proved a task and a half, particularly with English subtitles. For years they remained the subject of unseen intrigue to be brought up in conversation when discussing the Holmes stories, which happens a lot if all your immediate friends are also Holmes enthusiasts. It's perhaps a testament to our collective fascination with these stories that when my closest friend of many years passed away, the object I was given by his family to remember him by was his copy of The Annotated Sherlock Holmes. Some time later when I was looking through it, I found tucked between the pages a postcard from Jeremy Brett in reply to my friend's fan letter. It remains to this day one of my most treasured possessions. There are a number of other Holmes related stories I could tell, including one involving fellow reviewer Camus and his trip to the Reichenbach Falls, one that indirectly led to me inheriting bound copies of Strand Magazine, in which Conan Doyle's stories were originally published. But I'm getting off the point. The Hound of the Baskervilles was neither an early Holmes story nor the first of the Maslennikov film adaptations, but is the first one to appear on UK DVD. This is, when you think about it, not that surprising. Ask anyone to name a Sherlock Holmes story and this is one you can be sure that even non-devotees will have heard of. It's also regarded by those familiar with all five films as the best of the series, though is perhaps not the ideal introduction to the pleasures of Livanov's interpretation, given that this is one Holmes adventure in which Holmes himself is absent for almost half of the story. Should there be any of you not familiar with the plot, a brief summary is in order. After Sir Charles Baskerville dies in the grounds of his country house, his doctor, James Mortimer, fears he may have fallen victim to a two century old family curse involving a deadly and spectral hound. Concerned for the safety of Sir Charles' nephew and sole heir Sir Henry Baskerville, Mortimer travels to London to enlist the help of England's most famous consulting detective. Although freshly arrived from Canada, Sir Henry has already received an anonymous letter warning him off and is being trailed around London by a mysterious figure. 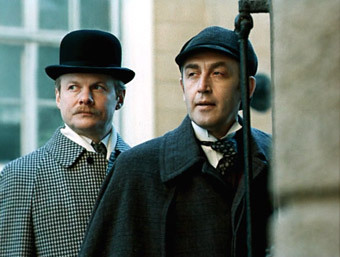 After meeting with Sir Henry, Holmes agrees to help him but announces he is busy with other cases, so instead asks Watson to accompany Mortimer and Sir Henry to Baskerville Hall. A number of strange events mark their arrival: armed guards are searching for an escaped convict; the sister of a local naturalist mistakes Watson for Sir Henry and warns him to leave; a figure is seen watching over the moors at night; and the couple employed as domestic help are spotted skulking the hallways of the Hall after dark. With Holmes occupied elsewhere, it falls to Watson to investigate the potentially deadly mystery of the Baskerville family. 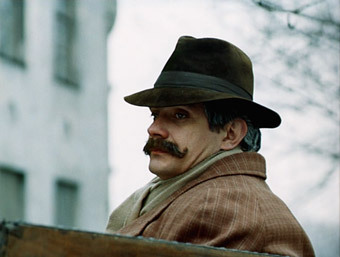 As played by Nikita Mikhalkov (whom international viewers my recognise for his role as Sergey in the 1994 Oscar winner Burnt by the Sun), Sir Henry is somewhat livelier than the man as described by Conan Doyle, enough to prompt my viewing companion – also a Holmes devotee – to suggest he was miscast and a little mis-directed. I beg to differ. In the original novel, Sir Henry has just returned from many years in Canada, which have effectively cast him as a bit of an outsider and new to the ways of the English landed gentry. In most English language film adaptations, this status is quickly established through the Canadian twang of Sir Henry's accent, not really an option when all of your dialogue is delivered in Russian. Here it's his personality that defines his outsider status, a man ready to take up the position of local lord but lacking the behavioural conventions that usually go with it, and in this respect Mikhalkov is effectively cast. This thoughtful approach to casting extends to the supporting players, from celebrated actor Oleg Yankovsky's turn as the slyly villainous Stapleton to Aleksandr Adabashyan's manservant Barrymore, who with his Quaker beard, arching eyebrows and cheerless expression looks a bit like an old-school silent movie villain. 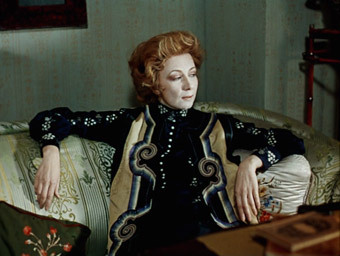 Borislav Brondukov makes for a pleasingly businesslike Inspector Lestrade, and personally I'd welcome the chance to spend more time in the company of Rina Zelyonaya's world-weary and everso slightly cynical Mrs. Hudson. So what of Vasili Livanov? Driven, intense and an enthusiast for his craft, he certainly makes for an arresting Holmes, and is more openly expressive of his friendship with Watson than a good many of his film and TV counterparts. But while a domestic audience would by now have got to know him through his previous adventures (both of which were split into three episodes apiece), after the first act here he drops out of the story, leaving Vitali Solomin's Watson to carry the film's sizeable midsection. And herein lies one of the film's real strengths. Impressive as Holmes though Livanov is, it's Solomin's Watson who quietly steals the show. This is a restrained but consistently compelling portrayal and a Dr. John Watson truly worthy of Conan Doyle, one whose intelligence, bearing and deductive skills make it easy to believe he could be trusted with guarding Sir Henry's safety until Holmes himself is ready to return to the fray. His stoicism in the face of potential danger feels only right for a man of his military background, one that movingly dissolves at the obvious delight of being unexpectedly reunited with his closest friend. More than anything else, it's Solomin's performance that makes me want to see the rest of the films in this series. There are, it has to be said, more briskly paced adaptations of this oft-filmed novel (Terence Fisher's tautly made 1959 version for Hammer comes immediately to mind) and a number that make more foreboding use of the Devonshire moors (or in this case the countryside of Russia and Estonia). But few if any are as satisfyingly faithful to the original novel, an approached echoed in Maslennikov's precise but formal approach to camera placement and editing, which unexpectedly shifts gear in a couple of brief but cinematically energetic flashbacks and really comes into its own in dual cinematographers Dmitri Dolinin and Vladimir Ilin's atmospheric use of candlelight and oil lamps in darkened corridors of Baskerville Hall. Which brings me back to the above mentioned image that first made want to track this film down. A key problem for any film adaptation this Holmes adventure is the late story appearance of the titular hound, a creature that on film is almost never as scarily spectral as it was on the printed page, hardly surprising when the creature in question is essentially just a big dog dressed up to look ghostly. But despite diverging a little from the novel's description and employing the very simplest of techniques, for just a few crucial seconds Maslennikov and his team come as close as anyone yet has to suggesting that the creature approaching Sir Henry really is of lethal supernatural origin. Framed in its original 1.33:1 aspect ratio (It was made for Russian television in 1981), this is a pleasing transfer from a solid original, one free of dust spots and boasting a better than expected level of picture detail. There's a familiar earthy period feel to the colour at times, but when required to be brighter (the night-time shot of Holmes when he is re-united with Watson, for example) the transfer responds well. The contrast is crisp with solid black levels, though a little fine detail is lost at both ends. There is a picture glitch that pops up a couple of times that I can best describe as digital twitching, where the encoding seems to be on the verge of coming apart – it does only last a couple of seconds each time and could be specific to the review disc. Presumably to avoid unwelcome compression issues, the film has been spread over two discs, divided into the two episodes in which it was originally screened. The Dolby 2.0 mono soundtrack is cleanly reproduced, with music and dialogue both faring well despite minor range restrictions. Not a thing. A real shame this, as most UK viewers would be new to this film and would thus benefit from a bit of background information, particularly given that this is not the first of the series. It's been a long wait, but for the most part this celebrated Russian take on The Hound of the Baskervilles lives up to its enviable reputation. It's unhurried pace and dedication to the original text may well have fans of the more action-driven bastardisations of Conan Doyle shifting in their seats, but true Holmes aficionados will be in their element here. The transfer has much to recommend it, but some background on the series would have made a useful extra. Nonetheless, for Holmes devotees this has to come recommended. ** Although not openly stated, the story can be calculated to be set in 1889 from the date engraved on Dr. Mortimer's walking cane – the cane was presented to him in 1884 and Holmes observes it is five years old.